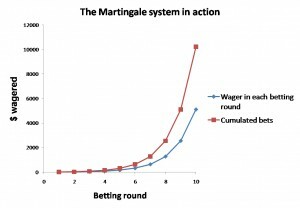 This article is about the Martingale betting system and why it doesn’t work in the long run. During the 3 years I’ve been running the Poker Bankroll Blog I’ve come across multiple get-rich-fast websites promising a sure way to earn heaps of money. Let me make one thing clear right from the start – when websites promise you a fool proof way of getting rich, in most cases they are the ones getting rich; not you. In order to make money you need to invest time and effort, get lucky or be brilliant. One of the most common underlying schemes on get-rich-fast websites, within the gambling/betting sector, is the Martingale betting system. The Martingale system originates from 18th century France and is applied to gambling situations where there’s a 50% chance of winning/losing, and the gambler wins his stake when the outcome of the bet is in his favor (as an example you can consider the simple coin toss, where the gambler wins his stake if the outcome is heads and loses his stake if the outcome is tails). In all its simplicity, the Martingale betting system dictates that one should continuously double ones original bet in the case of a loss until a winning outcome comes along. Here’s how it works: You start by betting 10$ on heads and lose; you then bet 20$ on tails and lose; you continue losing until your 80$ bet where you win 80$. In the process of winning 80$ you lost the 3 previous bets of 10$, 20$ and 40$ giving you a net result of 10$. By continuously doubling your stake, you will always win back your losses when your winning bet comes along and as a result – in theory – you will never lose. 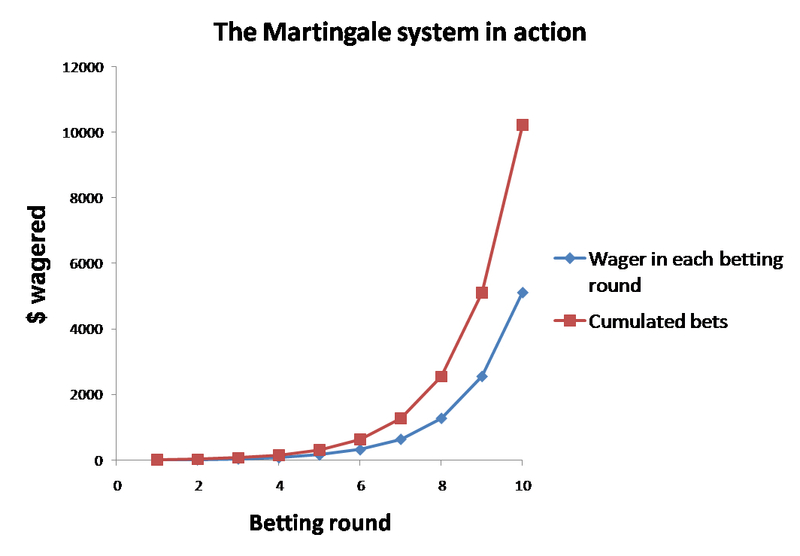 You may already start to see the drawback to the Martingale betting system. In order to win your losses back, the size of successive bets grows exponentially. This is illustrated in the graph below for an initial bet of 10$ and 10 successive betting rounds. As you can see from the graph above, your 10th successive bet has to be around 5000$ in order to win back all your previous losses and in the case of a win, the total profit of your betting round will only be 10$. Your expected value is even worse when you use the Martingale system on casino games such as roulette, where the chances of winning on black or red are less than 50%. The Martingale system does provide a way to eliminate losses, but it requires an unlimited bankroll and a betting site without limits. Since neither of these criteria are achievable in real life, the Martingale system doesn’t work. You might hit a string of good betting rounds where your bankroll is never in danger, but the one time where you run into a bad series of bets your bankroll will be at serious risk. Can you guarantee sports betting success by using a progressive betting system?